Cleaning the oven is tough, but keeping it spotless is practically impossible. One of the biggest culprits is food drips and crumbs that collect in the bottom of your oven and get baked on. This is where oven liners come in. They are mats that are placed near the bottom of the oven when cooking to catch any falling food. 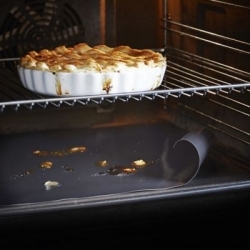 These liners can be easily removed and cleaned, helping keep your oven clean for longer. We look at what oven liners are made of, how to use them and what problems you may run into. Oven mats or liners are usually made of food-grade silicone, which is non-stick and heat-tolerant. Many liners also have a Teflon coating and are labelled ‘PTFE-coated’. The maximum temperature varies by manufacturer, but they are usually safe up to 260C (500F). Important: Do not use the liners above their maximum temperatures. This can cause dangerous fumes to be released. Make sure you buy an oven liner and not a silicone baking mat. 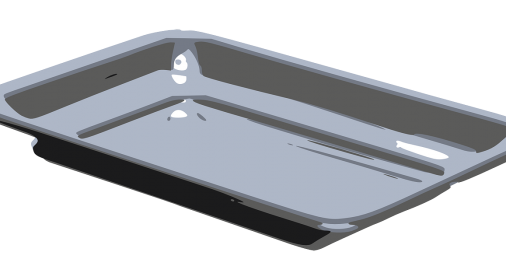 These thinner mats are designed to be used at the bottom of cake tins in place of greaseproof paper and are not heavy duty enough to catch drips in hot ovens. You should always trim the oven liner with kitchen scissors to fit your oven. Make sure there is a gap of one inch around the edges to ensure good air flow. Some liners may be placed on the base of the oven unless your model has a heating element at the bottom, which may melt the liner. In that case, place the oven mat on the lower shelf at least one inch from the bottom. Ensure that no air vents are covered. Most liners are dishwasher-safe, or you can wash them in warm, soapy water. One of the biggest problems with oven liners is melting and sticking to the bottom of the oven. This happens when the oven’s heating element is underneath the oven floor. These ovens heat up from below and this high, direct heat is too much for oven mats to stand. Important: Before you use an oven liner, always check in the manual that your oven doesn’t have a hidden bottom heating element. It is very difficult and potentially expensive to remove a liner that has stuck to your oven base. 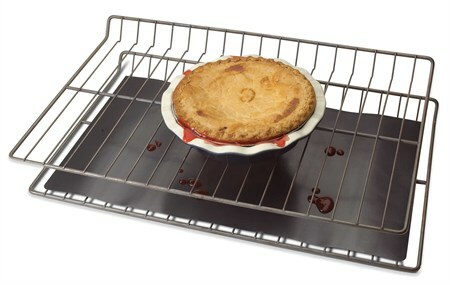 Some liner types come on their own shelf and can be used in bottom-heated ovens. 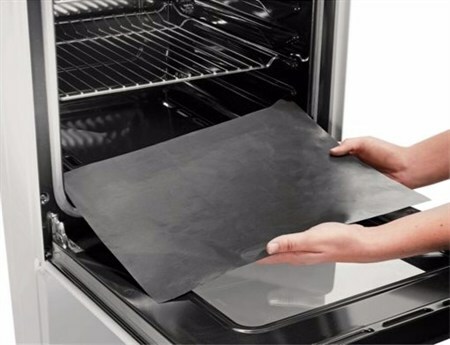 Some thin oven mats can flap in fan ovens and even float out when you open the door. Some users recommend weighing them down with baking cutters on the corners, but the best advice is simply to buy a heavy duty liner. 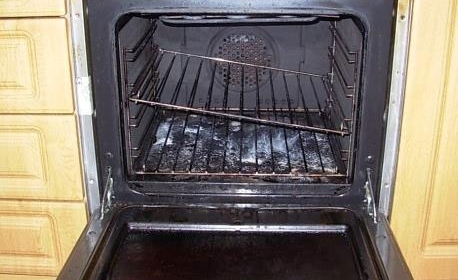 Always remove the oven liner before starting an oven’s self-cleaning programme. The high heat can degrade the mat and its coating may damage your oven. We often hear of people using a sheet of aluminium foil as an oven liner. However, we don’t recommend this on the bottom of ovens. Aluminium foil can easily burn and melt, and its lightweight nature means it flaps about in fan ovens. But you can line a baking tray with foil and use this on the bottom shelf. No matter how careful you are, your oven is bound to get dirty and grimy over time. When this happens you can try and clean it yourself, or call in the professionals! 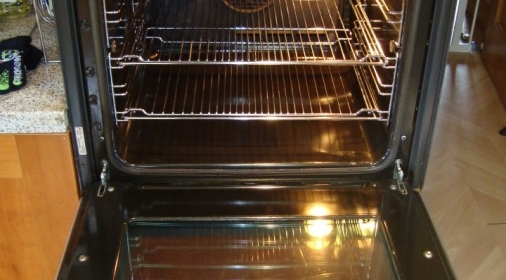 Ovenclean specialists can clean any oven and hob with our 100% caustic soda-free cleaning system. Get your oven sparkling clean and good-as-new. Call us today, on 0800 840 7127 or complete our online form for your free quote.